Tom Heaton is working hard to give Gareth Southgate a tough decision ahead of England's opening Euro 2020 clash with the Czech Republic at Wembley on Friday night. The Clarets skipper accepts Everton's Jordan Pickford was "outstanding" in the Three Lions' run to the World Cup semi-final last summer. Pickford has, however, come in for some criticism of late - with Heaton backed by many to push for the jersey, although Heaton himself was at fault for a couple of goals at Liverpool. Heaton said: "I think he's been outstanding wearing the England shirt. "I thought he was incredible in the summer in the World Cup. "We're here, we compete for the place. Of course, everyone wants to play. "Try and get your things right and see what the manager decides." Put to Heaton that Pickford's drop in form could offer him an opportunity, he said: "I don't tend to look at it like that, to be honest. I have to say. "I think, for me, it's about myself, what I do, what each individual does. "I try not to look at anyone else, as ever the thinking is on myself and we'll see what happens. "We've got a few days training. You obviously try and perform, and try to impress the manager, and see what decision he makes." Heaton, who has three caps for his country, went to Euro 2016 as third choice and was an established member of the Three Lions squad for just over two years, before his World Cup hopes were derailed in September 2017 by a dislocated shoulder. The 32-year-old watched on as Burnley understudy Nick Pope broke into the England set-up and capped a fine season by heading to Russia, with club competition then increased by Joe Hart's summer arrival. 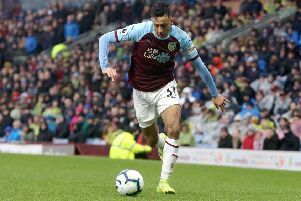 It meant that the former Manchester United youth prospect had to bide his time on the sidelines, although his impressive return to the fold at Turf Moor brought an international recall for this month's Euro 2020 qualifiers. "Brilliant," Heaton said of his return. "Obviously it was a frustrating first part of the season. "To get back in the team and be back here, it's sort of a nice end to a difficult journey, really. "It was tough. You get injured. It was a longer-term injury, I probably didn't know the details of it at the time, didn't realise the scale of it, to be honest. "The first part of it is OK, you get your rehabilitation in. Towards the end when you're mind sort of thinks that you're ready but physically you're not quite there, that can be a touch frustrating. "And probably the hardest bit of all is being back fit and then not playing. "It's difficult but you put the work in, the graft, the opportunity comes and thankfully I'm back here today." Heaton was given a lift at the end of last season having been named in the standby pool of players for the World Cup, but it was a double-edged sword, seeing what could have been at the same time: "Well, in fairness, I think being involved in it in any sort of form was brilliant, having not played a lot football over the nine months I was out. "To be still considered, still have two weeks here in the preparation was great for me personally, actually. It was a real lift after the end of a tough season. "I was delighted to be there. Obviously, it was a difficult moment waving them off and wishing them all the best of course, but on a personal note slightly tough. "But overall I think it was a real positive experience for me to be involved in it, especially after a difficult time. "And I enjoyed it and I was very thankful that the manager got me involved in that."